A simple, unhurried, fun, and worshipful Christmas is what I want this year. Our TtT team has been encouraging each other to think about what details are necessary or helpful for our family this season – and which are actually adding unnecessary stress or distracting from the meaning of Christ’s birth. The holiday season can be filled with constant activity. Places to visit. Parties to attend. Events to experience. Crafts and baking to be done at home. The list can go on and on. But will all of these activities actually help me and my family celebrate the birth of Jesus? 1. Decorating the Christmas tree, complete with its old mismatched ornaments and the Fisher Price nativity that the kids play with underneath. 2. Doing something to intentionally present the Bible story of Jesus’ birth. The past couple years, our family used the Jesse tree reading plan to tell the story of creation through Jesus’ birth. Here is a free printable version similar to what we have done. This year, our family is changing it up a little and using Names of Jesus Advent Cards. Every day, we read a card that has a verse to describe one of the names of Jesus. Then we hang that card up on our wall (all together the cards will form the shape of a Christmas tree when we are done). The picture above is my youngest son hanging up last night’s card. 3. Baking Holiday Waffle Cookies. This is something I have done the past few years. It’s an easy and quick recipe, but the cookies look fun and special – a simple way to make a celebration for Jesus’ birthday! 5. Making Gingerbread Houses. This would not have made my list of top Christmas activities, but it is apparently meaningful to my kids! There are plenty of other holiday activities out there. What didn’t make our list this year was visiting the zoo to see the lights. Or our town’s community tree lighting. Or creating hand-made ornaments. Or a million other activities that are wonderful and fun, but may or may not happen for our family this year. I’m alright with that because enjoying the season in an unhurried, thoughtful way requires our family to set some priorities and even say no to some great activities in order to make time for rest and simplicity. So, how about you? What activities make your family’s top 5 Christmas Activities List? What are you doing to be intentional about a #simpleChristmas this year? There’s nothing like building a gigantic fort in the middle of the family room! Rainy days are perfect for this, and we had a long one just the other day. My three kids went straight to work pulling in chairs, couch cushions, blankets, pillows, and flashlights. They planned and stretched sheets together, sectioning off their “areas,” and bringing in their snacks, books, and loveys. You get the picture. Eventually, the fort was put away and we had a family room to use again. I started thinking about how whiny my kids are, and how they don’t obey the first time we ask. But in the middle of my sad thoughts, God whispered, This was you, over the past three years. Well, ouch. The more I thought about it, the more I knew this was exactly true. So for a year, I maintained all of the “forts” I had up, squished in together, falling apart in some places, but still there. The thought of tearing down a fort that you love is painful and scary. My thoughts were just like my kids’ thoughts: But I still love this. But I’ll never be able to build this again. And one even deeper, more adult thought: But this is part of who I am. Who am I without this? These kinds of thoughts can stop you dead in your tracks. However, in my efforts to take care of my forts and my family, I didn’t have any time to devote to taking care of myself. I’ve been studying the book of Joshua, and it’s like “Journey to the Promised Land, Take Two.” Moses has died, and God has called Joshua to take over and lead the people into the Promised Land after so many years of wandering. God says it is time to move on. He gives Joshua specific instructions about when and where to go, stop, or linger. It is a perfect example of how God leads His people. God promises to be with them and fight mightily and make miracles happen, but their job is to inquire, listen, and then act on it in obedience. When he says fight, they are to fight. When he says tear down, they are to tear down. When they are to build up, they are to build up. 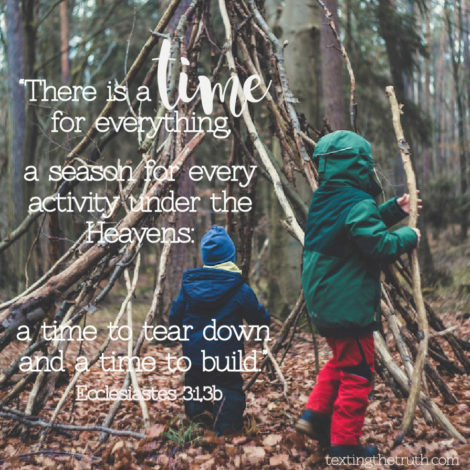 There is a time for everything, and the Lord is telling them what time it is. Over the next two years of my life, I slowly tore down my forts, one at a time. I sought confirmation from the Lord again and again, to make sure this was right. And He patiently said yes. I can imagine standing next to my kids for THREE YEARS, waiting for them to take down a gigantic fort. I would lose my mind! Ha. 😳 Fortunately, God is much more patient than I am. Here I am, with only one fort still left (this blog! ), and one new fort. Yes, there is room for something NEW to be built! I am taking better care of my body and spirit these days. I can read an entire book. I’m doing a Bible study with my whole heart invested. I feel like, in a way, the thing that is being built up is me. You are worth being built up. The time it takes to build into you is a good investment. God honors what you’ve given out of your emptiness. Do an inventory of your “forts.” Ask God to show you if there are any that need to be taken down. Maybe a fort needs to stay in your house, but not in your living room. Maybe a fort needs so major maintenance to be salvaged. Maybe there’s a fort that you need build. Like Joshua, let God lead you through your “house” to find out what needs to be torn down and what needs to be built up in you. As a mom, I feel like it’s an ever-present challenge to take care of myself. My children are one massive fort that obviously needs to stay put and be continually maintained. I can’t do everything, however, I can section off a space in my “family room” with bright-orange caution tape for just self-care. That’s not being selfish; it’s actually making me a better mom. I talked to a couple people that I trusted about how I was feeling–first, my mom and my husband, then some trusted friends. I thought and prayed about what things in my life were draining me. I slowly stepped away from those things. It was not without some tears, but I felt a huge sense of relief afterward. a shopping trip by myself. I started allowing myself to not feel guilty about going out with girlfriends for a breakfast or dinner, and leaving my family at home for a little bit. I read 5-Minute Retreats for Moms. There are tons of ideas in there! The next time I took the kids to the library, I picked out a fiction book for myself. I made doctor’s appointments for myself that were long overdue. I bought myself vitamins and started taking them regularly. I found moms to carpool with so I wasn’t spending all my time driving. In Organizing You, Shannon suggests that you take one day per week that you do not clean the house or run errands — instead, it is “You Day.” (Don’t you just love the sound of that?!) She says, “This is the day to set aside some time…to work on things that aren’t so repetitive… You need to schedule some time for things that fill you up and give you joy in the Lord,” (pg 95-97). Swap a day of the week with another mom — maybe she wants an hour to herself too! Or find a teenage neighbor to babysit the kids for two hours a week. Join the Y and take your kids to Child Watch. Be creative to find that self-care time.